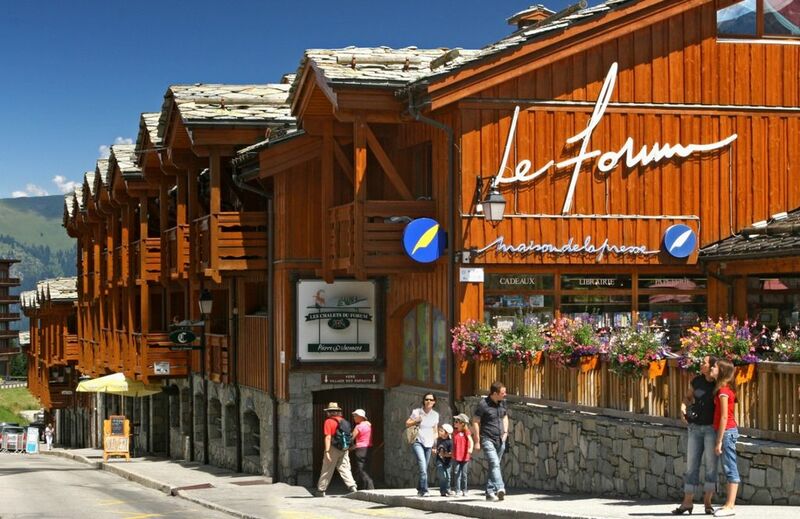 Located right next to the Quartier de la Croisette and shopping arcade the Chalets du Forum are set at the heart of Courchevel 1850, just a stone's throw from the resort's activities and services. An internationally famous ski resort that boasts a prime location in the heart of the 3 Valleys. Les Chalets du Forum are located 100 meters from the slopes and offers spacious and comfortable apartments, some of which are duplexes. The interior furnishings of this 4-star residence combine contemporary lines with generous wood-cladding, creating an authentic note of Savoie style. At the reception, children have at their disposal a space dedicated to them. A 4-star residence at the heart of Courchevel, an internationally renowned resort. A wide choice of activities for skiers and non-skiers to practice in a majestic mountain setting. Luxury apartments, spacious and comfortable. 1 living room, 1 sleeping alcove, 2 bedrooms, 1 kitchenette, 2 bathrooms and toilet. 2 single sofa beds and 1 sleeping alcove with 1 single bed. More spacious apartment with Nespresso® coffee machine, professional capsules for sale at reception. A legendary resort at the heart of the 3 Vallées ski area, Courchevel boasts an extensive range of leisure activities so you can make the most of the joys of winter: snowsports and non-skiing activities, fun après-ski, and shopping. - Alpine skiing and ski touring will satisfy lovers of active holidays. - An Olympic ice-rink, long toboggan run, go-karts on ice. - Horse-drawn carriage rides and dog-sledding, a gentle way to enjoy snowsports. - The magic of the International Festival of Pyrotechnic Arts in Courchevel. - In Courchevel 1850, the nights are just as activity-packed as the days. At the heart of the Trois Vall��es ski area, Courchevel is a protected natural site which faces the Petit Mont Blanc. A very chic and cosmopolitan holiday destination, with international renown, the resort showcases typical Savoyard characteristics. - The domain allows everyone, even children, to practice a great number of sports: cross-country skiing and Alpine skiing, snowboard, luge, snowshoeing, snowmobile, climbing, paragliding. - Courchevel represents the highest concentration of Michelin-starred restaurants in the mountains. - Benefit from olympic-level snowsports facilities in the Trois Vall��es ski area, which is the largest ski area in the world. - Courchevel 1850 is a family-labelled resort that children will love.